Singer Nitin Mukesh hasn't sung Bollywood songs for quite a while now but says he wouldn't mind making a comeback for his actor-son Neil Nitin Mukesh. "I don't sing any more in films. I only perform live on stage. The scene has changed. My style of things is very rare but I will sing for Neil hopefully," Nitin Mukesh told IANS here. Like any father, Nitin Mukesh too dreams of his son becoming the top actor of Bollywood but adds that the youngster is a good singer too. "He is a damn good singer. I want to see him happy and at the top in whatever he chooses; that's all. I know he has a passion for acting and I want to see him as the top actor of the country. He will sing once he has achieved his goal. Singing also needs lots of attention," said Nitin Mukesh, who has lent his voice to songs like "So Gaya Yeh Jahan" ("Tezaab") "My name is Lakhan" ("Ram Lakhan"). The proud dad says he gets very tense when his son has to do daring stunts, like he's done in upcoming film "Lafangey Parindey". Nitin Mukesh says now Neil doesn't tell him when he's doing edge-of-the seat action. "He doesn't tell me anything now because I get worried. I stay awake the whole night because it keeps bothering me. During 'Johnny Gaddaar', he didn't know that I would be so scared and after that he stopped telling me. He tells me after he is done with it," the singer said. 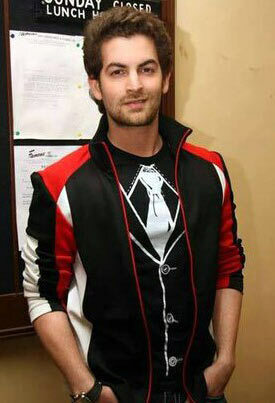 Asked if he drives the new Mercedes Neil has gifted him, Nitin Mukesh said: "I don't drive. I left driving 10-15 years ago. He (Neil) knows that papa won't allow anyone to touch his Mercedes so he drives whenever I have to go anywhere in it. He is a damn good son and a very nice child."